I am ALL ABOUT free food! And your birthday is the best time for it. Last year I was in the middle of a no-spending challenge so the free certificates really came in handy. This year, they are just as great! When the emails come in I print them out and put them in my purse. So when I am driving around and pass one of the places I just stop and eat! Earlier this week I enjoyed a delicious (FREE) meal from Noodles & Co, where the waiter made the great suggestion of the Pasta Cavatappi dish with a bowl of Tomato Basil Bisque soup. Very tasty! Today I ventured out solo to use my Benihana coupon which entitled me to 1 free entree. I normally do the hibachi style chicken and shrimp combo and figured that would be a great lunch on a cold day. Since it was lunch the price was reduced to around $11 or so. When I placed my order the waiter said “That is cheap for lunch time. You get up to $30 for a free entree. Why don’t you get something bigger? ?” I said , “Ok, maybe lobster? 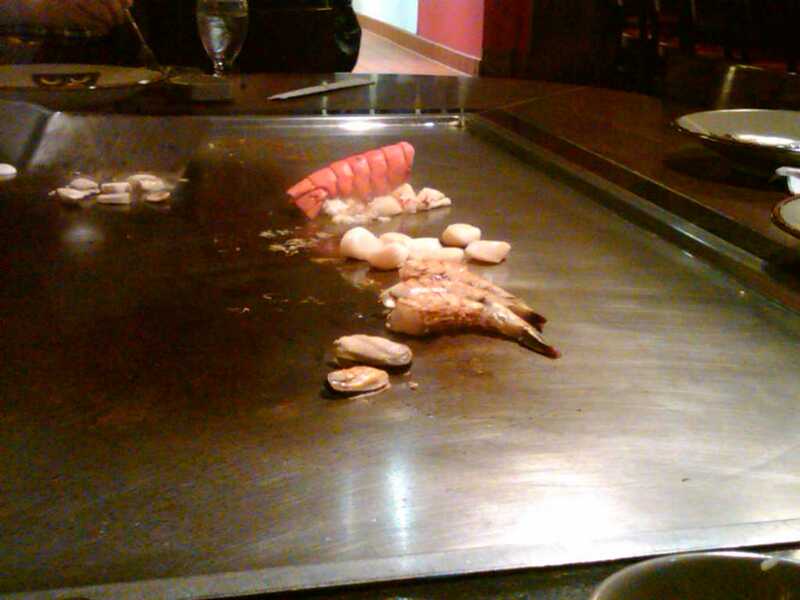 I dunno… you have any suggestions?” he immediately suggested the $35 Benihana Ocean Treasure which includes hibachi style lobster tail, mussels, scallops and jumbo shrimp. As a seafood lover, I was sold from the jump…. And it was AMAZING!!!!!!!! I snapped a pic on the grill. Can’t beat that! Up next: I still have Braxton Seafood, Maggiano’s, Brio Tuscan Grill, Cold Stone Creamery, FlatTop Grill, Applebee’s and a couple of others! The item of the day just earned me the official title of Girlfriend of the Year!! As a gadget geek, I am pretty sure Bobby loves not having to ever research anything electronic, because he knows I already have and can run down the list of features, how it works and why I/we need it. Bobby has a huge TV and last year I won a BOSE stereo system, which I donated to his entertainment center and hooked up to a receiver a friend of his gave him which gave an almost ultimate experience. The downside, was that Bobby loves his music. So in order to play the music from his macbook through the speakers, he had to hook the macbook to the receiver and essentially leave it there, since the cables weren’t long enough to keep the laptop on the couch. He had to get up and hunch over the mac to change songs/albums and after weeks of watching this I decided to make his life easier for Christmas…. So I bought him an Apple TV. FINALLY (over a month after Christmas) he opened the package and hooked it up to the TV today. You would think he won the lottery as he so excitedly called me to run through all the features (which I of course already knew, LOL) and the simple setup (which was a huge selling point for me). So what does all of this mean, in a nutshell?? – he can use wi-fi to connect to the sound system and doesn’t have to hunch over by the receiver. Now he can control it from the couch. – beyond the couch, he can actually control the music wirelessly from any room in the house. – he can rent movies in HD without us having to get calls from Blockbuster asking for the movies we rented weeks ago. – he can watch the videos from his and his friends YouTube channels on the big screen. In HD. Oooh Yummy! Good eatin' There's also a phone app that gives you coupon codes for various stores and such. I can't remember the name of it right now, but it's great when your on the go! You're a great girlfriend! I know that man lubs you girl!!! Keep up the good work! Thanks Styln!! I am pulling out my iPod right now to find that app!! !